A member delegate is the first person from an ICCA member company to register for the event. A member co-delegate is an additional person registering for the event from the same ICCA member company as the delegate. Each additional registration can be registered under this lower fee and you can make as many additional registrations as you want. Non-member organisations considering ICCA membership, may request to attend an ICCA Congress as an Observer (once only), in order to find out more about ICCA and its business opportunities, meet the ICCA members and make an informed decision whether ICCA membership would be beneficial. Observer status is by invitation only and there is a special registration fee. As suppliers of professional services to the international meetings industry, Observers are strongly encouraged to apply for ICCA membership. For more information on attending as an Observer, please contact Pat Soen Director Membership. Registered accompanying guests can attend all social functions, the accompanying guest welcome reception and the accompanying guests' tour programme. They are also allowed to attend the closing session if they wish. Please note, accompanying guests are not able to attend any other aspect of the Congress programme (chapter / sector meetings, general assembly, education sessions etc). Payment of the registration fee can be made by bank transfer (for bank details please see the invoice) or credit card (AMEX, MasterCard or Visa). To facilitate tracking of payments, please clearly indicate the invoice number. Please note, if you have not paid before the due date written on your invoice, ICCA reserves the right to send you a credit note and a new invoice with a higher fee if a registration deadline has passed in the meantime. Notification of cancellation of registration must be sent in writing to the ICCA Events Department. 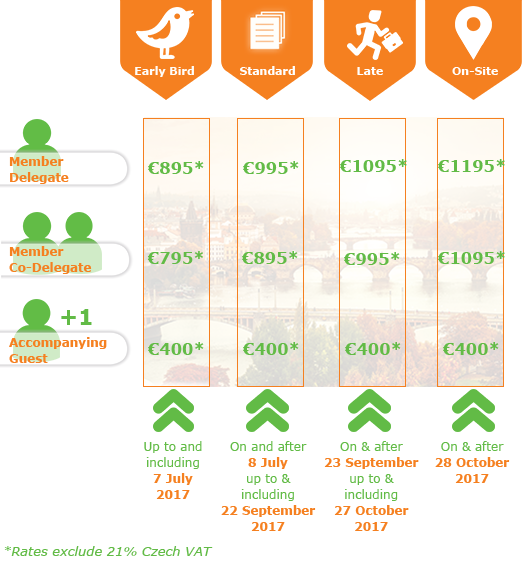 For cancellations received up to and including 29 September 2017, a cancellation fee of 100 Eur will be charged. Accompanying guests will be charged 50 Eur. For cancellations received on and after 30 September 2017, no refund will be given, full amount required. Name changes are not accepted, unless the participant is from the same company. It is strongly recommended that participants take out insurance to cover loss (including registration fees) incurred in case of cancellation, medical expenses and damage to or loss of personal effects. The organizers of theICCA Congress will not be responsible for any medical costs incurred by participants. ICCA and the Local Host Committee will not accept liability for personal injuries or for loss or damage to property belonging to Congress participants, either during or as a result of the Congress or during any tours. The Local Host Committee and ICCA act as agents only in securing hotels, transport and travel services and in no event shall be liable for acts or defaults in the event of injury, damage, loss, accident, delay or irregularity of anykind whatsoever during arrangements organised through contractors or the employees of such contractors in carrying out services. Hotel and transportation services are subject to the terms and conditions under which they are offered to the public in general. The Local Host Committee reserves the right to make changes where deemed necessary, without prior notice to parties concerned. All disputes are subject to Czech law.